John Pappalardo has spent his entire career working to protect the traditions of Cape Cod's oldest industry and to create new opportunities for the next generation of fishermen. He has been the CEO of the Cape Cod Commercial Fishermen’s Alliance since 2010. Before that, he served for a decade as the organization's Policy Director. Pappalardo was a member of the New England Fishery Management Council from 2002-2011. He served five of those years as its chairman, guiding the Council through implementation of the newly amended Magnuson-Stevens Act as well as the region's first two catch share programs. He has also been on the National Organics Safety Board and spent 13 years on the Massachusetts Marine Fisheries Advisory Commission. 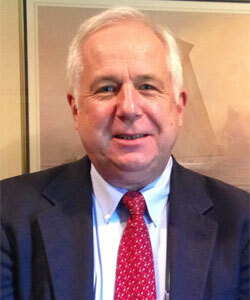 He currently serves on the Joint Oceans Commission Initiative and the Cape Cod Chamber of Commerce Boards. A native New Englander, Pappalardo came to Cape Cod after completing a B.A. at Seton Hall University. While working as a commercial clammer fisherman, he became interested in the plight of the region's small boat fishing industry and determined to advocate for its future. He helped build the Cape Cod Commercial Hook Fishermen's Association—the predecessor to the Cape Cod Commercial Fishermen's Alliance—in 1999. Gene Curry is the principal of the Law Office of Eugene R. Curry. The firm provides corporate, regulatory, and intellectual property solutions to the business, arts, and non-profit communities and estate planning and administration services to individuals. His clients range from start-ups to multi-national corporations. Gene serves as on the Board of Directors of the Cape Cod Chamber of Commerce and as General Counsel to the Cape Cod Technology Council, Inc. and Bourne Community Boating, Inc.
Gene also chairs the Infrastructure Committee of the Technology Council. He also has served as a coach for Start-Up Weekend Cape Cod and has been a speaker at the Geek Girl Tech Conferences. Prior to establishing his current firm, Gene was a member of Eckert, Seamans, Cherin, & Mellot, LLC, a partner in Larson & Curry, and a senior staff attorney at the Federal Trade Commission. Gene is a graduate of Upsala College and the University of Nebraska College of Law. John Bullard has spent a career in public service, much of it focused on environmental protection. As Mayor of New Bedford from 1986-1992, he brought the City into compliance with the Clean Water Act by building a secondary wastewater treatment plant, a project that contributed to the health of Buzzards Bay and cost him his job. He headed the first federal Office of Sustainable Development for the Clinton Gore administration and then returned to NOAA from 2012-2018 to manage living marine resources from Cape Hatteras to Canada. This included fisheries management and the protection of species such as the endangered North Atlantic Right Whale. Prior to that he served as President of Sea Education Association in Woods Hole, teaching college students about the science of the oceans. As a volunteer, he has been very active on the Board of the Buzzards Bay Coalition. He and his wife, Laurie live in Westport Point. He is an active sailor having sailed and raced in the Atlantic, Arctic, Caribbean and both Pacifics. 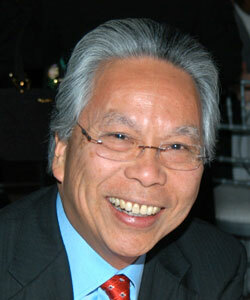 Stephen G. Tom is an international satellite and broadband communications industry executive, whose later career led him into smart city development focused on improving commercial, public and social services, and local economic development. Stephen’s communications career has been defined by industry achievements including large scale videoconferencing projects to worldwide news, sports, and entertainment television content distribution via satellite and fiber optics, and networking for emergency relief in the aftermath of storms and manmade catastrophes. Some of Stephen’s leadership roles have included that of president and CEO of Washington International Teleport; Executive Director, Pacific Telecommunications Council; Chairman and President of Society of Satellite Professionals International (now Space & Satellite Professionals International); Chairman, World Teleport Association; Director, Business Development, Asia-Pacific, for Intelsat; and Director of Development, Intelligent Community Forum. Scott Vandersall is the current Vice President and Regional Manager for The Cape Cod Five Cents Savings Bank in Orleans, MA. He has held this position since January of 2017 and is responsible for overseeing the business lending activities in the Lower and Outer Cape Cod Markets, managing a team of three other professionals serving our customers and communities. He has worked for Cape Cod Five since 2015 and has over 30 years of commercial lending and banking experience, with most of that experience in NH and the North Shore and Merrimack Valley regions of MA. He moved to Cape Cod full time in 2013 with his wife Amy and currently resides in West Dennis. Scott holds a bachelor’s degree from Colby College and a Master’s in Business Administration from Boston University Questrom School of Management. He is active in the local community serving as Treasurer and board member for Community Connections. He is also a volunteer on the Health Impact Team for Cape and Islands United Way, and a member of the Yarmouth Rotary Club. He enjoys golf, biking, and ice hockey in his free time.